Manipur Forest Department continued to organize mass agar plantation drive at various parts of the State after the State Chief Minister N Biren Singh formally launched the drive during June end this year. 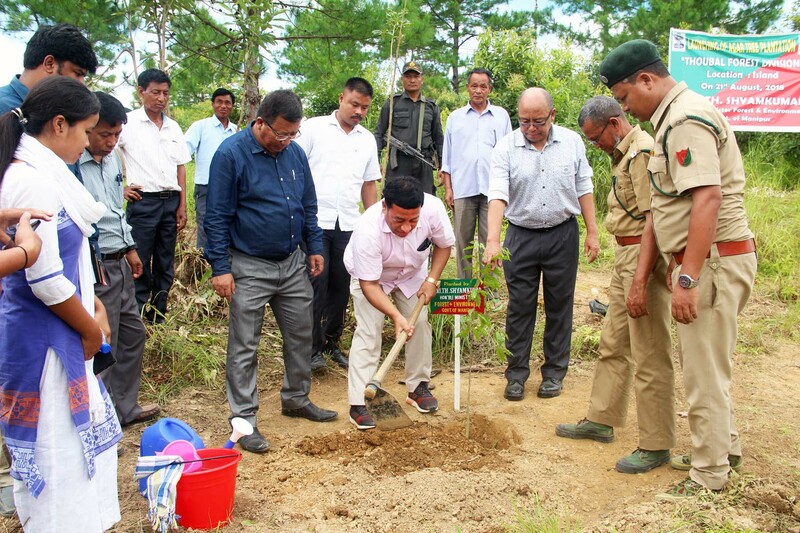 Accompanied by senior forest officials, State Forest and Environment Minister Thounaojam Shyamkumar Singh on Tuesday launched the agar plantation programme under the Thoubal Forest Division at the island village in Senapati district. Interacting with the villagers including the Forest Department officials, Minister Shyamkumar said the agar plantation will help the villagers to earn income and also help in protecting the environment of the State. Stating that around 3,300 agar trees will be planted in the surroundings of island area, he advised the villagers to wholeheartedly nurture the trees till its maturity. Replying to queries of the villagers, he said the villagers can earn up to Rs 30,000 – Rs one lakh per tree within a span of 7-8 years and the matured trees will help them to earn more income. He said the mass agar plantation will help in providing sustainable economic development in the State. It may be mentioned that the agar plantation was launched by Chief Minister N Biren Singh at Langol Reserve Forest of Luwangshangbam on June 24 last. The plantation is an initiative of the government to provide alternative livelihood to the villagers in the State. The plantation drive is carried out in the State following MoU signed with the Government of India and Government of Laos during the last year’s Manipur Sangai Festival. Government of Laos will provide maintenance fund, necessary treatments for the trees and a market place for the agar trees planted in the State. Kereilhouvi Angami, Principal Chief Conservator of Forests and Head of Forest Force (PCCF & HoFF), officials of Thoubal Forest Division and locals of the area attended the agar plantation programme. Earlier Forest Minister Shyamkumar who also holds Town Planning portfolio also inspected the under-construction water treatment plants and a water reservoir at Koreingei, Sangakpham, Canchipur and Iroisemba. The construction projects are under the funding of Ministry of Housing and Urban Affairs, Government of India to provide portable drinking water to all urban areas under the Atal Mission for Rejuvenation and Urban Transformation scheme.